What's an 'Essential' Graphic Novel? — The Greatest Comic Book of All Time! What's an 'Essential' Graphic Novel? Cover by Ivan Reis and Joe Prado. Purchasing the latest issue of the DeConnick and Rios weird western Pretty Deadly at my local comic shop yesterday, I was handed a copy of DC Comics' new DC Essential Graphic Novels catalogue for 2016. Both a marketing exercise and an effort at self-consecration, it is a document worth exploring in a little detail. On the first page no less an authority than Batman explains (when Nightwing understandably says he doesn't understand what this thing is), "It's a catalog to help guide new readers to DC's reading collection, starting with the essential 25 most culturally relevant graphic novels." Sure enough, the catalogue's first section comprises twenty-five works dubbed "essential" by DC marketing, each one accompanied by a brief synopsis, ordering information (including both an ISBN number and a Diamond Comics Distributors product code), and blurbs from diverse sources, mostly outside the comics world. Are they "graphic novels"? 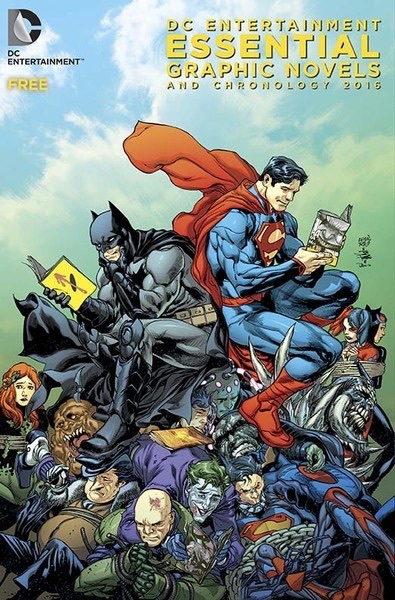 Only two (Batman: The Killing Joke and Batman: Earth One) were initially released as stand-alone "original graphic novels," while eight are collections of limited series (including obvious choices like Watchmen and Dark Knight Returns as well as more recent works such as Superman: Red Son, All-Star Superman, and Daytripper). Fourteen out of twenty-five collect runs of on-going series, such as Sandman, Batman/Superman, Preacher, and Batman: Hush). Are they the "most culturally relevant"? I note that DC's critically acclaimed Vertigo imprint and its more ambivalently received New 52 books are equally represented with six titles apiece. Following the "essential twenty-five" are seventeen, presumably optional, "Modern Classics." Twelve of them are superhero comics, with the oldest (albeit in a recent edition) being Morrison and McKean's Arkham Asylum and the most recent (I think) collecting the first issues of the "Batgirl of Burnside" arc, which began in October 2014. The greatest comic book creator of all time? Of the forty-two "essential" and "classic" titles featured so far in the catalogue (really surprised they didn't go for another ten books to reach the magic number), the most produced by one creator (the writers repeat much more than the artists, reflecting not only the differing career structures of writers and artists but also the increased association of comics "authorship" with writers that is implicit in the "graphic novel" discourse) is the six books written by DC Chief Creative Officer Geoff Johns. Grant Morrison follows with four titles, and Alan Moore and Jeph Loeb are tied at three each. After the Modern Classics follows a section labelled "DC Comics Essentials," which features a character biography and some suggested titles for major DCU properties, including Batman and the Batman family (41), Superman (23), Wonder Woman (9! ), the Justice League (21) and League members not prominent enough to warrant a page of their own (4), the Flash (13), Green Arrow (9), Green Lantern (14, 8 of which are written by Johns), and the Teen Titans (6). That several works from the first two sections are included again here perhaps suggests that the catalogue writers were aware of their two different audiences for this document, one oriented to cultural prestige and another oriented to character-based fandom. Notably, this section also includes some action figures, but presumably only the most essential ones. The next section highlights media tie-ins, with repeated works again suggesting another possible audience for the catalogue. The properties highlighted include both the expected DCU superhero blockbusters – titles related to the upcoming Batman v Superman and Suicide Squad films and TV series like Arrow, The Flash, Gotham, and Supergirl – and Vertigo titles with television adaptations, such as iZombie, Lucifer, and Preacher. The Vertigo imprint is highlighted in the next four sections. The first two divide the Vertigo line between "Essential Series" (well, the first volumes of their trade paperback collections) and "Essential Graphic Novels," which collect limited series; Neil Gaiman and Bill Willingham's Fables have a one-page section each. Mad Magazine and all-ages titles come next, followed by four pages of "essential" collectibles (action figures and statues). The catalogue closes with detailed lists (in suggested reading order) for major and major minor characters and properties. In chapter 5 of our book we discuss the way that writers of the "British invasion," typified by Alan Moore, led the way for the "quality popular comic book" at DC and, later, the Vertigo imprint under editor Karen Berger (see Julia Round's work on Vertigo and Berger). This is not to say that they are the "best" but that they constitute a particular generic category analogous to "quality TV" and "quality fiction." It is, we argue, a basically middle-brow position in any cultural field: simultaneously the most prestigious of the commercial works and the most commercial of the prestigious works. And that is, honestly, a pretty good place to be. This logic is still evident in the Essential Graphic Novels 2016 catalogue, particularly in the overeager use of the "graphic novel" discourse and in the pride of place still given to Moore and Gibbons's Watchmen, Miller's Dark Knight, and Gaiman's Sandman. 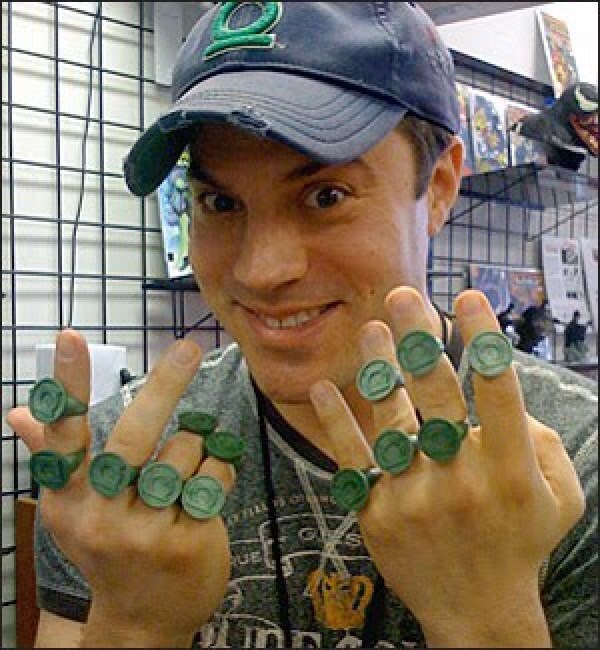 However, its strategic function of activating DC's backlist (a competitive advantage against Marvel at a time of declining market share) introduces several other logics that disrupt and contest the otherwise straightforwardly consecratory project: promoting upcoming and ongoing titles, moving collections of New 52 books, realizing sales from synergies with adaptations, and selling action figures and collectibles, to name a few. Whereas the middlebrow "quality" comic book effectively reconciles the autonomous (prestige-oriented) and heteronomous (market-oriented) principles of cultural production, these two forces play against one another in the catalogue, ultimately undercutting the claim to cultural authority taken on by the persistent use of that word, "essential."